The weather's heating up, and that means one thing: theme parks! But when your kids are very young, the options are limited. They don't have the stomachs for Six Flags, and who wants to go all out on Disney World when they won't remember it? Lucky for us there's a theme park less than two hours away that's a slam dunk for toddlers: Sesame Place! Located in Langhorne, Pennsylvania, this all-things-Muppet theme park is the perfect size and scale for toddlers. Part water park, part amusement park, and part theater, there's enough to keep them busy till nap time...and beyond! But like any other outing with little ones (or any advanced military operation), it's only fun if you've prepared for every (un)expected incident. We've got your cheat sheet right here to make it the perfect Sunny Day. Before you load up the sippy cups and strap into the car, read on for our tips on how to take on Sesame Place like your name is Elmo. The first installment in our guide is about getting in. Tickets, passes, parking: there's a lot to know, and we've got tricks below. Then, click here for our second installment about how to be #winning once you get into the park. Sesame Place's face value ticket price at press time is $70 for a one day ticket and $85 for a 2-day pass, but think of this as simply a starting point. Keep in mind that everyone 2 and older will need a ticket, and there's no kids pricing. If you get on the mailing list you'll be alerted to their frequent flash sales, and if you plan to visit more than 3 times a year, a season pass is worth it. 2-day passes are also a good deal because they don't have to be used on two consecutive days. If you buy one for today you can use the second day through the end of 2018. If you think you'll only go once this summer, Sesame Place is a great day trip in the fall or winter for Halloween, Thanksgiving, or Christmas. 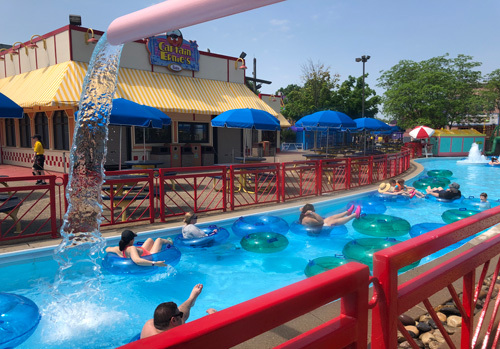 The water rides section of the park transforms into seasonal activities like hay rides, and additional midway rides are available that aren't around during the summer season. The cooler weather is a relief! Not worrying about overheating or sunburns is a wonderful thing. Just make sure you research all the ticket choices because there are a lot of price points: single day weekday only, single day weekend, specific-date tickets, any day tickets, 1 and 2 day tickets. Tickets in the fall and winter can be as low as $20, so keep that in mind as you figure out when you want to use your 2-day tickets. You may want to use them earlier and then grab the cheaper tickets if you visit later in the year. We are a family of four than includes a child under two. At first we thought that means we'll need three season passes, but sometimes I take the kids midweek while my husband is working or sometimes he will take our oldest there alone for a daddy-daughter outing. So it made the most sense to buy only two season passes. Season passes also have other perks like 25% off food and merchandise (makes the sting of a $3 water a little less intense). and special privileges such as meet and greets or advance seating at shows or on rides. The most souped-up pass of all is the Super Grover. It gets you free admission and parking at all SeaWorld and Busch Garden parks. 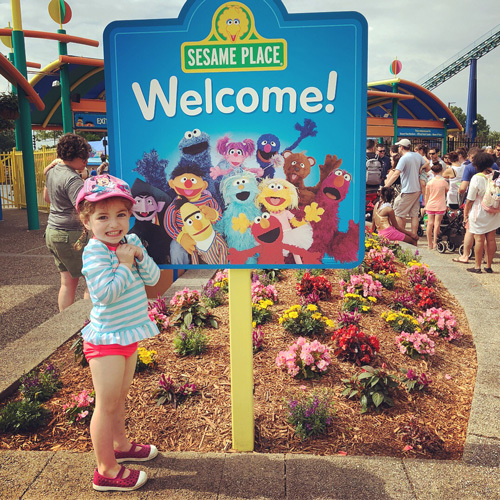 As far as Sesame Place is concerned, the only additional features it offers above the Big Bird level is that you can get ride-again privileges and preferred parking (which is not much better than regular parking). Unless you are a regular at the other theme parks, this is not worth the extra $78 in price. Save your money and do the Cookie/Transferrable or Cookie/Big Bird combo. There are two great times to buy a season pass. From November to March, season passes start at around $90 and if you buy for the year ahead, it includes all visits for the rest of the current calendar year. Another great time to buy is around August, when the "Buy Next Year's Pass and Get the Rest of the Year On Us" sale is announced. It's a great deal because the water park is still open, and if you plan it right you can get 4 months of fun (maybe 6 visits?) for free and still have a pass for all of next year. That's almost 2 years for the price of one. If you wait till August the pass price will be higher. The price last August started at $113. But getting almost another whole yearly pass for $23 more than the lowest sale price is a great deal. But wait!! Do you have a teaching license? Every October, Sesame Place opens a registration period for teachers in New York, New Jersey, Pennsylvania and Delaware to get a free season pass for the next year. You register online, then bring your teaching certificate and an ID to pick up your pass in the park. It's only valid for the teacher's admission only. You don't have to be currently teaching as long as you have a teaching license. Sesame Place has a general parking lot for $20 and a preferred parking lot for $25. But don't get nervous, this ain't Disney. Both of these lots are next to the park and set up in a way that you can park about 50 feet from the entrance if you're the first car in. I usually get to the park around opening time and I've never had a longer walk than 30 seconds to my car from the front gate, and that's in the general lot. You do not need "preferred" parking. If you decide to get a season pass, you're going to want one member to have more than the basic Cookie level so you can get free parking. Ideally you'd use a season pass 8-10 times, right? Based on that you'd pay $160-$200 just to park. The Big Bird pass is $42 more, so the parking pays for itself after about 2 visits. Also mentally it's a nice motivator to go. You'd be surprised what a deterrent it is to visit when you have to pay $20 just to leave your car. They don't check IDs at the gate, but they do scan the pass, so I don't think you could hand it to the car behind you, but you might be able to borrow a friend's season pass that has parking privileges. • Pregnant women save 50% on the base ticket price. • Seniors save 50% on the base ticket price. • Active duty military members receive 1 complimentary visit for them and up to three direct dependents. • Season Pass holders can purchase single-day guest tickets for 50% off the base price. So if you think you might be pregnant between now and 2019, you might want to hold off on getting a season pass. Grandpa and Grandma probably don't need them either. The only downside to these discounts is that the lines can be long and slow-moving. If you need to stop at the front gate for tickets, get to the park at least 15 minutes prior to opening to get in line. If the difference between an online deal and a front-gate-only deal is not a lot, say, $5, save yourself the hassle and buy online for immediate entry. It's not easy to tell a 3 year old they have to wait in line when they can see all the fun stuff happening just inside the gate. There's almost always a Groupon for entry. The one right now is $67 for two visits and a free meal at one of the visits. That's a great deal as the kids meals are about $10 with a drink and adult meals are $13 without a drink. The visits are good anytime before the end of the year. Like all amusement parks, Sesame Place has a Fast Pass system, but it's not always a good fit for toddlers. Our fickle toddler is constantly changing her mind about what rides she wants to go on, and which are too scary, so for us the Magic Queue wouldn't pay off. Luckily, unlike Disney or Universal, I've never seen the lines that long. Especially if you go early and head straight to your favorite rides. Perhaps the Magic Queue is a good idea for an older child who will be riding more independently while you hang back with your younger one? In that case, it's $16 to Fast Pass each ride once, and $32 for unlimited Fast Pass access all day long. They sell a limited amount of these, so once you decide to go for it, call or book online. Sesame Place also offers a PhotoKey Access Pass, where you'll receive every photo taken at character meet-and-greets. This $50 one-day pass (also available as a seasonlong photo pass) is a mixed bag. It can be a good deal if you're going alone with a few kids and won't be able to get your own pictures, or if you want to be IN the pictures without begging the people behind you to use your phone every time. But for the pass to feel worth the price you actually have to get in front of the photographers, which means waiting in line at the character meet and great stations. Which can be torturous on a hot busy day. Also, we're not talking about Annie Leibowitz. We've noticed that the framing and quality of the photos are the same or worse as you would take yourself using your phone. Buying photos a la carte is about $20 a pose, and with overstimulated kids trying to ham it up for the camera, I'd be surprised if you had more than two you wanted to bring home anyway. Skip the pass, use your phone, and take your chances on buying any photos taken that you fall in love with at the photo booth on your way out. If you're not doing the pass you can take your own photos at the meet and greets. Remember to tell your kids to look at your phone, not the photographer's camera, or all your pictures will have eyes looking left or right. The best deal in the park if it rains or rides are shut down for weather. 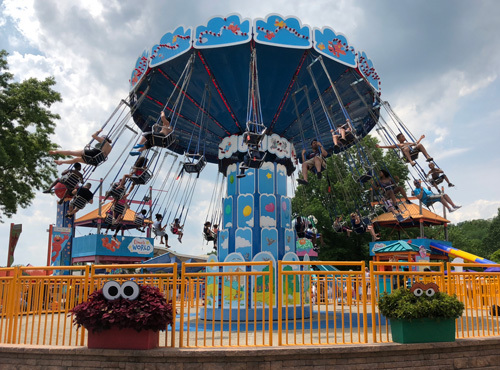 The Sunny Day guarantee means if it rains continuously for one hour while a guest is in the park, Sesame Place will issue tickets valid for a return visit any operating day during the current operating season. The best part is unlike your admission tickets, there is no name attached to the Sunny Day tickets. We were there one day last year and the rides got shut down because it was too windy. While it wasn't fun to literally peel a toddler off the carousel that they loaded us onto and then told us to get off, we marched over to the Welcome Center (you can also go to Guest Relations) and got three brand-new 1-day passes to use whenever and for whomever we like. If you're not sure if your weather qualified for a Sunny Day replacement ticket, stop by anyway. Our friend saw a little bit of rain on her visit, and while she didn't qualify for Sunny Day replacements, she did get Fast Passes to use on rides. You may have noticed blue tented areas all around the water park. Those are the private cabanas available for day rental. They may seem totally extravagant, but bear with us for a little math. Let's say your original plan is to rent a hotel room near Sesame Place because you want the kids to have a nap or you think the day will be too taxing to drive home without a break. What if instead of the hotel, which, let's face it, will be annoying at best (and that's IF the kids fall asleep in the same room as you in their pack n plays at a reasonable hour while you stare open-eyed into the dark), you spend that money on a private cabana, chilled at the park allllllll day, then drove home at night and everyone gets to sleep in their own beds? The cabanas seat six, so if you're a family of 3 and you split it with a friend, suddenly the $250 total fee doesn't seem like so much after all. For $125 each, you and the other family would get a free beverage, a souvenir towel for each family member, and a large locker. Plus you'd have a 10' x 10' space that's all your own with a shaded, private, comfortable place to relax. If you shell out for the most luxurious $400 cabana, you get an exclusive character meet and greet in the cabana area, a splash zone just for cabana guests that's always empty, unlimited beverages including milk and juice, concierge service, and one meal per person (in addition to the basic perks I just mentioned). Oh, and if you're a season passholder, take an extra 25% off those prices! That's a sweet $100 off the luxury cabana! Or split the cheapest one with a friend for less than $100 each! Children's birthday parties can be upwards of $800 nowadays at those jump places. For half of that you could have an intimate family celebration at the park. I'm not suggesting you get one every time, but it wouldn't be the craziest thing to splurge once a year. I hope this has gotten you all revved up to experience the park for yourself! Click here for our next installment where we dish out our favorite tips once you get inside the gates. That's it for this week! Like what you're reading? Help keep the tips flowing by following us on Facebook or Instagram and signing up for our weekly emails at BabyGotChat.com. And as always, check our website for events and our easy-to-navigate chart of every weekly kids library program in Westchester. Just be sure to check the date you wish to attend against the library's calendar, because many programs are wrapping up for the school year.